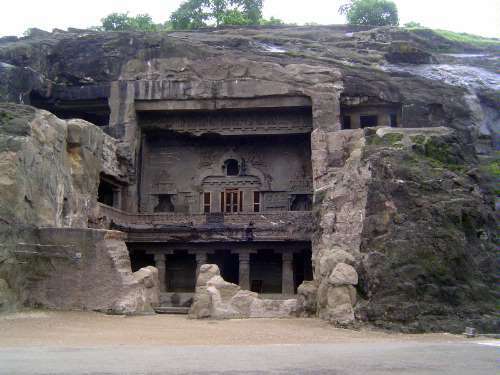 The first caves on the site, from 550 to 600, were Hindu, but a series of Buddhist caves were created under Chalukya rule, from about 600 to 750. They constitute what one scholar calls "a visual record of the early development of tantric Buddhist art." 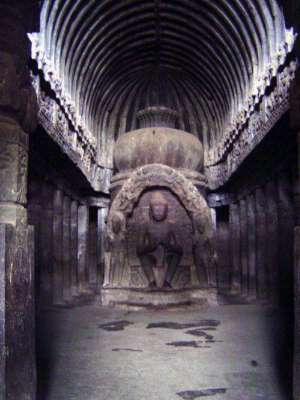 See Geri H. Malandra, Unfolding a Mandala: The Buddhist Cave Temples at Ellora,, 1993. 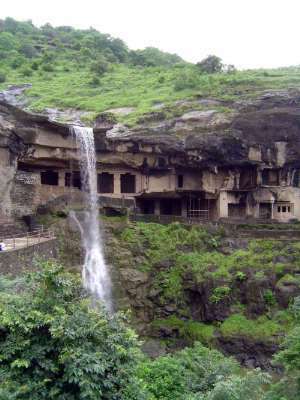 He continues: "...in ages past, sappers possessed of magical skill excavated in the defiles of the mountain spacious houses for a length of one kos [mile]...." The waterfall is more than an amenity: it probably has a lot to do with the creation of temples here. 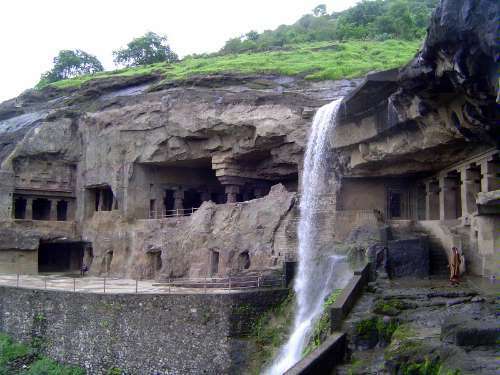 In other words, the caves at Ellora were created partly because the rock presented a face suitable for excavation but also the waterfalls, though seasonal, made the the place a tirtha, a sacred ford or crossing from the mundane to the spiritual world. 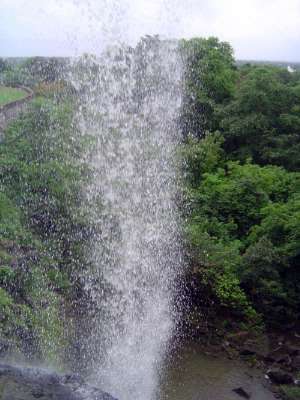 The view of the same waterfall from the mouth of the cave behind it. And the view back, ending in a small room with an image of the Buddha. 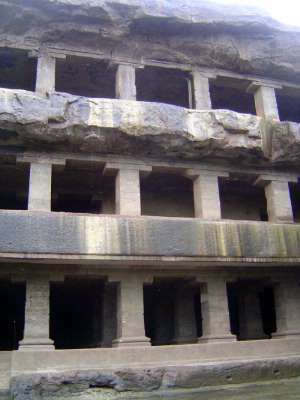 The room here (Cave 5) is 117 feet deep by 58 wide. 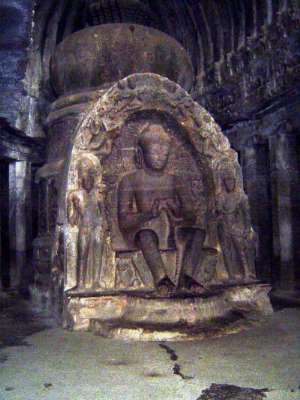 Cave 12, paid for by an unknown Buddhist patron. 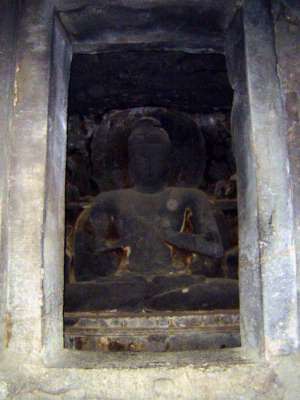 Inside, a figure of the Buddha. 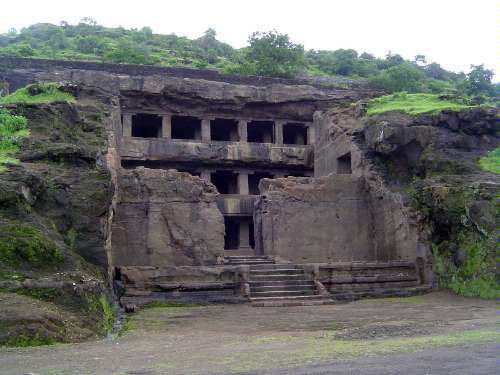 At this, the Muslim chronicler draws the line: "In ancient times when the sinful infidels had dominion over this country, certainly they and not demons (jinn) were the builders of these caves, although tradition differs on the point; it was a place of ownership of the tribe of false believers. At present it is a desolation in spite of its strong foundations; it rouses the sense of warning (of doom) to those who contemplate the future (end of things)." 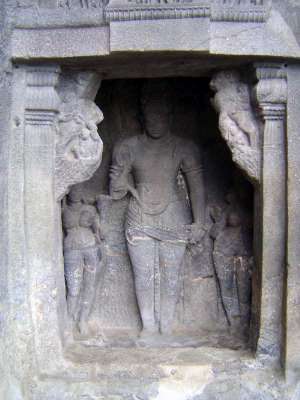 Here, from a different level of the same cave, an image of the Buddha in the famous bhumisparsha mudra, touching the earth to symbolize his moment of enlightenment. 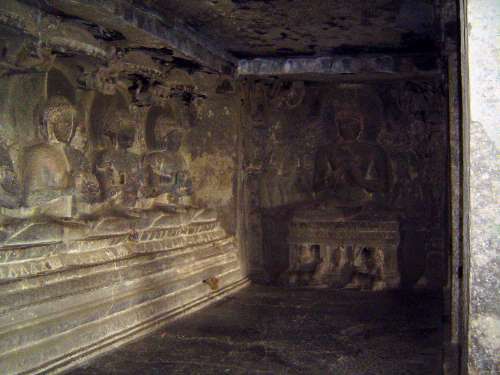 A circle of Manushi or human Buddhas rim the room. 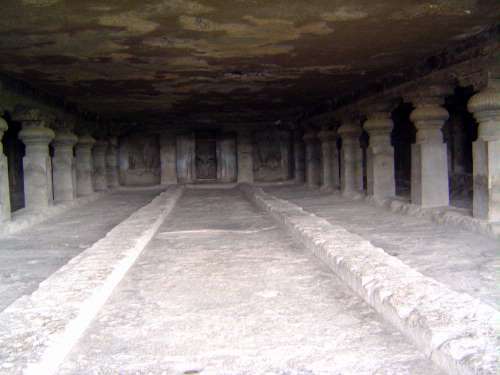 Cave 10, or Visvakarman, named for the Hindu god of architecture. The upper level, with flying figures around a window that shines into the room behind. This is that room, with a roof carved to imitate wood rafters. The room is informally called the Sutara Jhopadi or carpenter's shop. 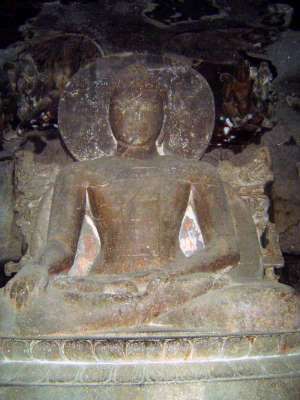 The central figures is the Buddha called Vairocana, attended by the Buddhas Avalokitesvara and Maitreya. 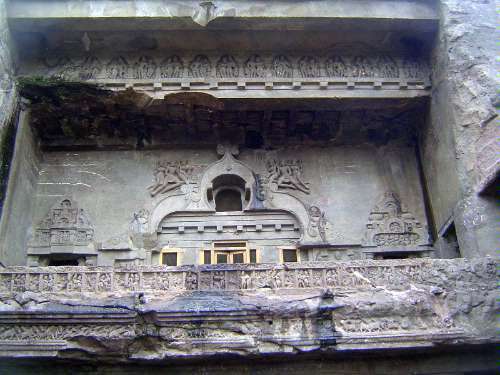 Maitreya is also represented in a niche on the upper level balcony.